Lean principles applied to the service sector and focused on employees, whether in training or in empowerment, reinforce the importance of the human factor in the process of delivering services. Besides focusing on people that make part of the transformation process, Lean Service also focuses on the customer. Unlike manufacturing, the first contact for selling service is the customer. The service company deals with the customer directly on the front line, differently from most industries. There are three different categories in the service sector. First, professional service with high focus on people, contact time and processes. An example of this category is a corporate bank. Second, service shops, hotels or rental service with medium focus on customisation and front office and back office. Third is mass service with low attention to equipment and customisation, a great example is the transportation service. Provide exactly what they want, exactly where and when wanted. 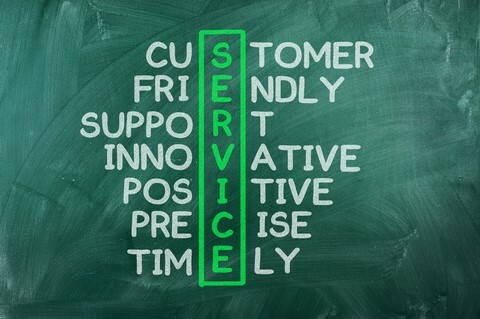 The first compares customers expectations with their perceptions of service delivery. If the perceived service is better than the expectations, they turnout to become happy customers. The second law states that the first impression can influence the rest of the service consumption experience. The employees who deliver the service. In manufacturing operations, high costs and focuses are related to raw materials and equipment, but in service operations, manpower is one of the most relevant factors in the cost of doing the job. The human element is a highly relevant variable in the services sector. Despite the similarity of some Lean service principles and lean manufacturing, Lean Service does not have a single or specific model that can be taken as reference in any situation or area of service like standard steps. On the contrary, there are several models which can be applied according to the nature of the service. For instance, there are services related to hospitals, logistics, food production, food consumption, air transport of passengers or cargo, information technology and so on. The service area, differently from the manufacturing area, strongly depends on human factors, which is responsible for the prospection, execution and delivery of service to the customer, who expects service with high quality. A recent study introduced the concept of the “Lean Consumption”. The idea is not that the customer shops less but shops with less difficulty and disruption. In this context, companies should adopt practices to eliminate inefficiency in production processes, and it is now the moment to take initiatives to deliver consumption experience more efficiently and with less sacrifice. In a company-to-company relationship, some examples reinforce the use of lean initiatives. If a company examines its inbound process, for instance, it can find ways to not waste driver’s time and supplier’s vehicles with inbound and outbound activities. The Lean Service operations must offer what customers want and where they want it. Supermarkets build stores where customers are and connect them through distribution centres – strategically located. This increases speed and agility on the product distribution. Lean logistics must be up-to-date with new techniques to increase performance (especially delivery time) and customer satisfaction. Suppliers should understand the customers’ needs, apply lean methodologies to their processes and adapt themselves to customers. But often this is a two-way highway. Customers and suppliers should be strategically and operationally aligned. Currently, there is a saying well known in airlines companies: low cost/low fare. The focus is to reduce aircraft time on the ground. For this, customers are partially involved in some activities to reduce this time, for example, just before landing, the crew requests all passengers to collect their waste and magazines. Besides reducing ground time it helps reduce expenses with cleaning. Another lean logistics strategy at airports is the boarding time. Passengers located at different portions of the aircraft are called at different time intervals. In hospitals, Lean is applied to reduce the waiting time. They have rules and procedures specific to different types of patients and procedures, such as for first aid, surgery, tomography, X-ray, lesions, etc. Lean logistics in this business form teams responsible to precisely identify each case, quality performance indicators are used to help find possible problems, surgery tools, tomography equipment’s and rooms needed.